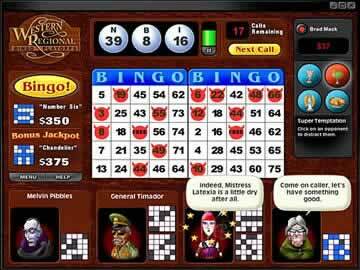 Saints and Sinners Bingo Game Review - Download and Play Free Version! Perfect game for any fan of bingo. Charms and monetary bonuses add to the excitement. Graphically the game is sound. Sound quality is just okay. You'll See Bingo in a Whole New Way! Enter the wildest bingo tournament in the United States! Face opponents ranging from helpful grandmas to cutthroat generals in 20 places across the country. You've never played bingo like this before! This quirky bingo game is fast-paced and amusing as you hurry to create different bingo patterns to beat your opponents. You can play with one or two cards and you'll receive three numbers at a time to mark on your cards as fast as you can. Each bingo hall has different objectives, like winning with a diagonal line, four corners, a little cross and more, or a cash objective. You can earn 20 charms to help you, like the apple pie charm, which keeps your opponents from marking their cards for a few seconds, or a lucky charm, which will give you a number on your card. This game will keep you entertained for countless hours because it combines the excitement of fast-paced competition with the humorous remarks your opponents make and the strategy of using your charms. All gamers can enjoy this game because it's simple to play but tough to master. Can you become the bingo champion? Challenge yourself now with Saints and Sinners Bingo! 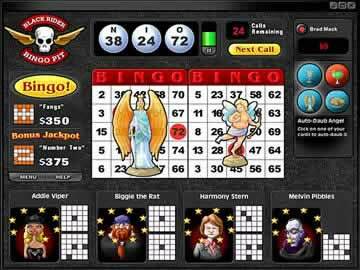 Saint and Sinners Bingo is a much improved PC version of the classic Saturday evening church service dollar bingo. Though you won't be able to appreciate the comfort of a warm and cozy quilt after a win, you will enjoy the prizes while advancing from the East Coast to the West, playing bingo along the way. This version of bingo does a great job of expanding upon a relatively simple game through incorporating charms, stiff competition, and differing winning cards. Bingo, for those of you unfamiliar with the name, is a betting game of chance. In the game you purchase a card that has 25 numbers in a 5x5 grid. The x-axis is labeled B-I-N-G-O, while the y-axis remains unlabeled and is 5 rows long. The card is filled with numbers and then random numbers are called. If “B-5” is called and you have a 5 in the B row you cover that spot with a chip and wait for the next number to be called. Traditionally if you get 5-in-a-row covered you can call “Bingo” and after being checked for accuracy, you win and receive the prize for the round. Saints and Sinners Bingo keeps the essence of the game while expanding on the rules in certain areas, making it more appealing and playable. In this game you are on a mission to make it from the East Coast to the West coast, playing bingo along the way. There are two routes to take (Saint or Sinner), both leading to the same end goal. While playing you earn money at each destination and you acquire charms that can be used to your benefit. The charms are earned through winning, trading, or purchasing. These tokens are used to ensure that you'll get a certain number called, they can stall your opponents, or they can be used to check your work. The charms are beneficial and become essential for having success in this game. As you travel from location to location, the stakes become higher and higher and the competition increases. To advance you must earn an amount of money or earn a certain amount of bingos. Bingos vary from location to location and can be anything from 5-in-a-row, to covering the 4 corners of the board or getting a block of six. The differing types of bingos add to the playability and increase the difficulty of the game. It becomes hard to watch the cards of your opponents accurately when the bingo changes round to round. Graphically Saints and Sinners Bingo is high achieving and well done. Though the graphics are not the best on the market, they are well done and accurately portray what the game designers were trying to convey. This is a bingo game so simple yet clear graphics are important, and that is what was done. As far as the sound is concerned this game does struggle. The sound effects and music are repetitive and get annoying after awhile. Turning the sounds down or off is probably something you will be inclined to do after playing for several minutes. The only major flaw of the game outside of the sound quality is with the monotony you might face. Though it's advanced and incorporates other elements, this game is still a bingo game. Bingo can get boring and doesn't change that much. Not having an online mode that lets you play others throughout the world takes away from the game and could have helped with the inevitable monotony. However, despite not having this the game is pretty fun. 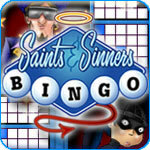 Overall, Saints and Sinners Bingo is a world class bingo game that is both engaging and entertaining. The use of charms and traveling throughout the country add surprisingly captivating elements to the game. Though playing bingo might get old after awhile, Saints and Sinners does as good of job as any keeping the game fun. If you are a fan of bingo and are wanting to play even though a professionally made quilt is not up for grabs, you should definitely give this game a chance. The mild content and easy gameplay make this a game for all ages.